Not just a bottle with a spout. Our bottles are lovingly blown by mouth. 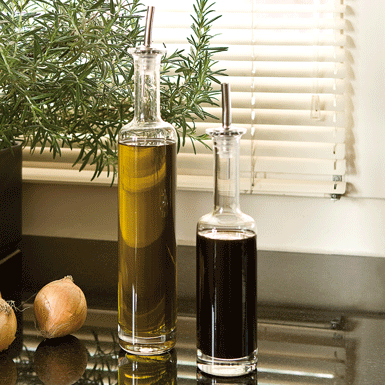 The larger one is perfect for olive oil, the smaller one for spicy balsamic. The hygienic stainless steel spout is delivered with it. You just have to love them: Bottiglia Oliva (5 dl) and Bottiglia balsamic (3 dl). Mouth-blown into the mould with stretched rim.